One of the scariest parts of college is paying for it. There are basically two kinds of financial aid: money in the form of gifts (grants, scholarships, etc.) and money that has to be paid back after graduation (student loans, work-study, etc.). The good news as far as student loans are concerned is that President Obama has recently announced a Student Aid Bill of Rights that will make getting and paying back student loans much more simple and easy. President Obama stressed in his announcement speech just how important it is to go to college, and he’s absolutely right. Does getting a college degree cost money? Yes, it does. However, by attending any one of the 112 California community colleges, you are getting the best value for your money. Also, it’s important to see any money you spend getting a college degree as an investment. In strictly financial terms, the money you spend at college is going to come back in the form of higher earnings when you’re done. Nurses get paid much more than nursing assistants, for instance, and you can’t get certified as a nurse without a degree. The same is true in pretty much any other field. 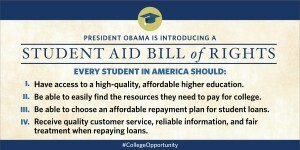 The new student aid bill of rights will make things better for students who borrow money in many ways. For one, a website will be created which shows all federal student loans to a student at one place; currently, it’s hard for students to keep track of and manage different loans. Banks that service federal student loans will now be held to higher standards of providing information about loans and providing excellent customer service. Debt collectors will be fair, transparent and working in a positive and polite way to get borrowers out of debt. Every California community college has a financial aid office with experts to help you navigate the system. With this new Bill of Rights, their work will be easier. In short, the federal government wants students to be able to pay for college and are doing more to help. So, the sooner you set up an appointment to talk with a financial aid expert about your options at the California community college of your choice the better.